retrobrad Forum Index -> The monthly retrobrad competition! Is the monthly competition a good idea? Send me a retro gaming related picture (that you have drawn...) for your chance to win $20! anyway send in your pics and the winner will be announced at the end of the month! Heres the first pic, submitted by Damon. great picture mate - i especially like the detail in the shield and sword, very nice! this is a great idea brad, have there been any other entries? i used to be a fan of the zelda series its great to see someone having a go! nah, there hasnt been much interest in this at the moment so theres just the one pic since the start of july. Alright, its the end of the month and theres been a grand total of ONE entry! so i guess this is the clear winner of the $20! maybe when theres a few more forum members ill have to have another comp. and a big thanks to tomz for supplying some GREAT prizes!!! including a C64 1750 ram expansion and a fast loader cart!!!! I Think it`s about time the monthly retrobrad competition was up and running again,what do the rest of you guys think? maybe after the convention we can have it back...what do ya say brad? sounds like a good idea, ive seen on kim lemons site, people sent in logo designs. well if anyone has any designs - send them in! also, if anyone wants to, you could even submit a new site theme. and then a 550x138 pixel image for the side bars. (the left and right side bars have the same image, they just display different sides of the image. How do i make these super mario world themes you ask??? this program lets you edit super mario world levels. but i used it to make my site! just enter in a level number to open (the default is 105) and then i just did a screen grab of a part of a level, pasted it into paint and then edited it to how i wanted. TIP: the level numbers in the level editor are HEX numbers so if you were to count up from level 001, 002, 003, 004, 005, 006, 007, 008, 009 then next level would NOT be 010 but it would be 00A then 00B, 00C, 00D, 00E, 00F then it would goto 010.
if you have any trouble with using any of these editors, let me know! Not trying to win anything ( it has nothing to do with retro gaming .. 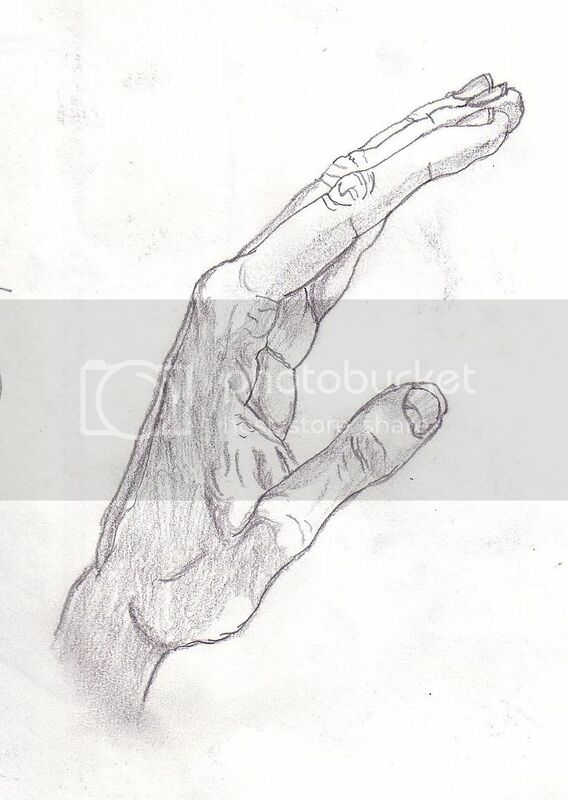 Sorry ), but here is a picture i drew of my hand about a year ago. I drew my thumb a bit too long though I am currently in the process too of trying to retrieve some of my old Amiga Deluxe Paint artwork from around 1991-1993. Hope i can get it all back !?. thats a really cool pic, im guessing you're right handed? ?